Having split their first two games since coming out of the All-Star Game break, the Washington Capitals take to the road on Saturday to face the Montreal Canadiens in a Saturday afternoon contest. 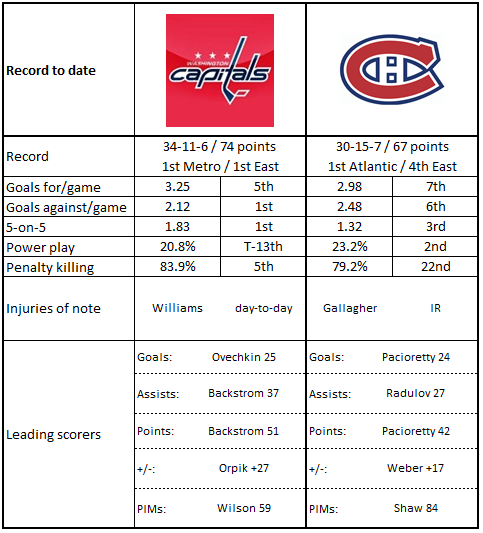 The Caps will be looking to sustain a quality effort for 60 minutes, a feature missing from their repertoire in their last two games, while the Canadiens will be trying to get off the treadmill that has seen them more or less alternating wins and losses for almost a month. Starting with a 4-1 loss to the Caps on January 9th that snapped a three-game winning streak, the Canadiens are 5-6-1, failing to win consecutive games in that 12-game stretch. Over those dozen games the Canadiens averaged a respectable 2.67 goals per game, but their scoring defense has been a problem, allowing 3.08 goals per game. And that makes one wonder about goaltender Carey Price. Price has appeared in and been the goaltender of record in 10 of the 12 games in this recent skid. Over those contests he is 3-6-1, 3.12, .902. It is not that he had faced an significantly elevated volume of shots (31.7 per game in this stretch versus 30.0 per game for the season), but the profile of his opponents has been telling. The four games in that stretch in which he allowed four or more goals came against four of the top five scoring offenses in the league – Pittsburgh, the New York Rangers, Minnesota, and the Capitals. Price has shown signs of emerging from his personal slump, posting more Price-like numbers of a 2.21 goals against average and a .936 save percentage in his last five games, going 2-2-1. He is 6-10-4, 3.02, .908, with one shutout in 20 career appearances against the Caps. There has been a bit of an all-or-nothing quality to the goal scoring aspect of Max Pacioretty’s game recently. In his last dozen games he does have five goals, but three of them came as a hat trick against the lowly Buffalo Sabres last Tuesday. He still leads the club in goals (24) and ranks in the top five in the league. He is still on a pace to finish with his fourth straight 30 goal season (38) and his fourth straight 60-pont season (66). Discounting the abbreviated 2012-2013 season, this would be his fifth straight full season hitting those marks, making him one of the most consistent point producers in the league. Pacioretty is 2-9-11, minus-4, in 25 career games against the Capitals. Injuries have hit the Canadiens defense hard. Only one defenseman – Shea Weber – has appeared in all 52 games so far this season. The club has employed 12 defensemen so far. It has required young guys to step up. One of them, at least in the offensive end, is Nathan Beaulieu, the youngest defenseman on the club to have appeared in at least five games this season (24 years old). In the 46 games in which he has appeared, his numbers are precisely those he posted last season in 64 games – two goals, 17 assists, and 19 points. In the Canadiens 5-6-1 run of late, though, Beaulieu is a minus-8, not a good number even if he is called upon to log big minutes (averaging almost 23 minutes per game in this stretch compared to just over 20 per game for the season). In nine career games against Washington, Beaulieu is 0-1-1, minus-3. 1. Montreal’s special teams are quite special at home. The Canadiens rank ninth in home power play efficiency (21.4 percent) and seventh in home penalty killing (84.6 percent). They are one of just three teams to rank in the top ten on both sides of special teams at home (Minnesota and Columbus are the others). 2. The Canadiens do not work and play well with others. Montreal is tied for fourth (with Anaheim) for most minor penalties taken this season (199), and no team has been hit with more game misconducts (three, tied with Dallas and Toronto). 3. Even with the arbitrariness associated with the numbers, the takeaway-to-giveaway ratio for the Canadiens is horrible. That ratio (0.62) ranks 25th in the league. 4. Montreal is a remarkably consistent team in one respect. They are just one of three teams in the league (Minnesota and Columbus being the others) with a positive goal differential in all three regulation periods this season overall – plus-5 in the first periods of games, plus-9 in the second periods, and plus-14 in the third periods. If you are wondering, the Caps have a positive differential in the first periods of games (plus-31) and third periods (plus-23), but they are even in the second periods of games. 5. Montreal does do the possession thing well. They rank third in Corsi-for at 5-on-5 overall (52.28 percent) and third in Corsi-for adjusted for score, zone, and venue (52.93 percent; numbers from Corsica.hockey). 1. Only two teams in the league rank in the top ten in both road power play efficiency and road penalty killing (Toronto and the New York Rangers), but the Caps are almost there. They rank seventh in road power play (22.1 percent) and 11th in road penalty killing (83.3 percent). 2. The Caps could stand to be a little more careful with the puck. Arbitrariness of the numbers aside, the Caps have the fifth-highest total of giveaways in the league (542) and have the sixth-highest average of giveaways per game (10.6). 3. No team has more wins this season by three or more goals than the Caps (15, tied with Pittsburgh). 4. The Caps are still looking for that elusive first 4-on-4 goal this season. They are one of six teams without one, and only Minnesota among the other five is playoff-eligible. 5. The Caps have slipped a bit overall in their Corsi-for number at 5-on-5 (they now rank seventh), but they still rank fourth in the league when adjusted for score, zone, and venue (52.90 percent; numbers from Corsica.hockey). Phillip Danault occupies a special place in Capitals history for a player who was never a part of the organization. In 2011, the Capitals traded the 26th overall pick in the entry draft to the Chicago Blackhawks for winger Troy Brouwer. Chicago selected Danault with that pick. Brouwer went on to play in more than 300 regular season and playoff games for Washington, while Danault started his climb up the developmental ladder. He spent two more seasons in Canadian junior, and then he moved up to the Rockford IceHogs in the AHL. He got a cup of coffee (two games) with the Blackhawks in 2014-2015 and another 30 games with the big club in 2015-2016, but at the trading deadline of the 2015-2016 season he was traded with Chicago’s second-round pick in the 2018 entry draft to Montreal for Tomas Fleischmann and Dale Weise. This season with the Canadiens, Danault is one of five players to appear in all 52 games to date, and he has more than doubled his career totals in goals (four prior to this season), assists (6) and points (10) with his 10-17-27 scoring line. He is 0-1-1, minus-1, in two career games against the Caps. Danault’s odd place in Caps history is made a bit more strange with this fact. In the history of the club’s drafts before 2015, the 2011 draft (the one in which the pick used to take him was traded) is the only one for the Caps in which no player ever played in as many as one NHL game with any club. Four players were selected – Steffen Soberg, Patrick Koudys, Travis Boyd, and Garrett Haar – none of them advancing to the NHL. If Alex Ovechkin is the intoxicating spirit of the libation known as the Washington Capitals, Nicklas Backstrom the ice that cools the drink, and Evgeny Kuznetsov the secret ingredient, then T.J. Oshie is the straw that stirs it. With Oshie in the lineup this season, the Caps are 29-8-5 and just 5-3-1 when he isn’t. Washington is 15-0-1 in games in which Oshie recorded a goal, 19-0-1 in games in which he recorded a point. In addition to being second in goals and fourth in points on the club, he is one of four forwards with more than one credited hit per game, leads all forwards in blocked shots per game, and has a superb 1.72:1 ratio of takeaways to giveaways. He is the only Capital forward to average more than one minute per game on both power plays (2:48) and penalty killing (1:06), and his performance in the trick shot phase of the game borders on legendary (3-for-4 shooting this season, and since he came into the league in 2008-2009 has the highest shooting percentage (55.1) of any player taking 20 or more shots). In his last 15 games he is 9-10-19, plus-10, over which the Caps are 12-2-1, the two regulation losses coming in game in which he did not record a point. In 11 career games against Montreal, Oshie is 4-5-9, minus-1. This is a contest between teams competing on the same space of statistical turf. Both rank in the top four in the league in score/zone/venue adjusted Corsi at 5-on-5 (Montreal third, the Caps fourth). And, both teams will be anchored by goaltenders thought to be among the best of the league’s best, but who have had their own struggles of late. In other respects the teams have similar numbers. What the Caps bring to this game is what they bring to most contests, and advantage in depth, especially at forward. Oh, and an 11-0-2 record in their last 13 games in Montreal.